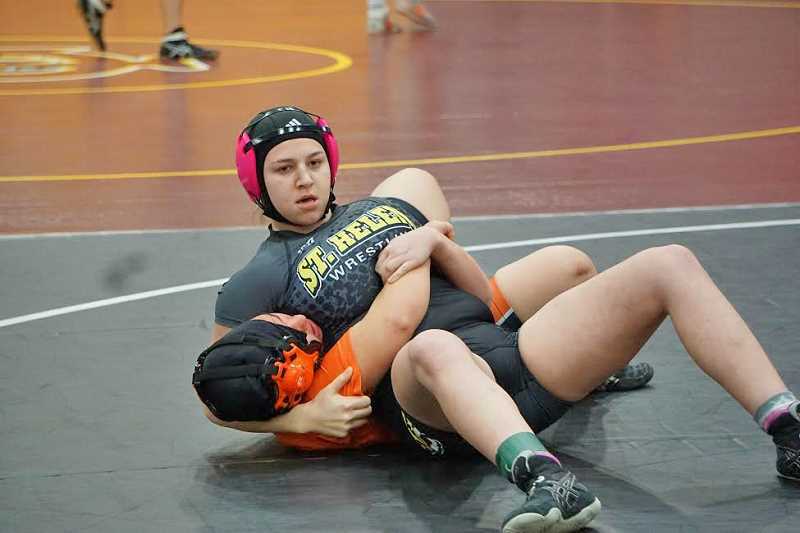 Kara Smith swept to the top of her Bob Beisell Invitational girls' 160-pound field of five with a pair of pins against Class 6A talent Jan. 13 at Forest Grove High School. The Lions senior received a quarterfinal bye, took down Centennial sophomore Simone Willingham in 4 minutes, 27 seconds in the semifinals and made quick work of Beaverton freshman Maria Reeder (:47) for the crown. Smith's 24-point title and senior Quinnlyn Coddington's four-point run to the third consolation round at 180 were good for 12th as Class 6A Forest Grove (71) led Class 3A Warrenton (64) in the 17-team race. 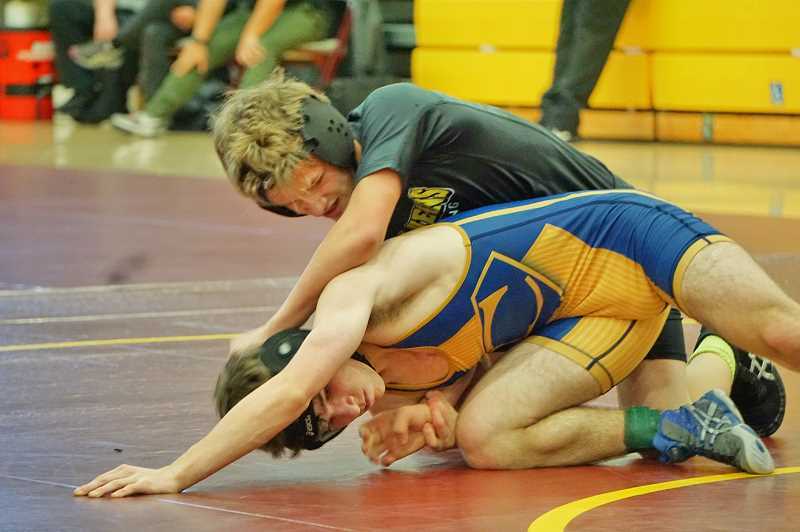 "I thought the this weekend at Forest Grove went really well: That was probably the most competitive tournament that we will wrestle in this year, other than districts and state, and the kids wrestled as well as they have all season," St. Helens coach Greg Gadbois said. In the boys' contests, Caleb Carter, also a senior, improved his record to 15-6 as he came away third in a Class 6A-laden heavyweight division: He beat Tigard sophomore Johnny Nomani (3:50) in the first round, survived Canby junior Kyler Boyd 11-10 in the quarterfinals and fell to Madison junior Rory Sullivan (2:56) in the semifinal before banishing Tigard junior Javier Velasquez (1:48) to fourth. Tristin Buchanan (fourth, 113), Ryan Burri (fifth, 152), Matthew LaVoie (sixth, 132), Shawn Lee (sixth, 145) and Maverick Rask (sixth, 160) helped their side to eighth with 79 points as Class 6A Century (209) outgunned Tigard (199.5) for first. The Lions are scheduled next to wrestle at Milwaukie at 7 p.m. Thursday and to enter the nine-team Tigard Invitational at 9:30 a.m. Saturday. Round 1: Harrison Womack, Newberg, pinned Austin, 1:44; Consolation round 1: Austin received a bye; Consolation round 2: Austin pinned Ronan Chapman, Lakeridge, 3:53; Consolation semifinal: Hunter Nakamoto, Glencoe, def. Austin, 11-6. Round 1: Buchanan received a bye; Quarterfinal: Buchanan def. Nick Marquez, Canby, 10-7; Semifinal: Killian Ryan, Tigard, pinned Buchanan, 1:37; Third-place match: Rolando Orozco, Forest Grove, def. Buchanan, injury. Round 1: Zack Vorvick, Tigard, pinned McFarland, 1:01; Consolation round 1: McFarland received a bye; Consolation round 2: Cole Brink, Lakeridge, pinned McFarland, :48. Round 1: LaVoie pinned Ethan Guidry, Newberg, 3:26; Quarterfinal: Edgar Garcia, Tigard, pinned LaVoie, 2:27; Consolation round 2: LaVoie def. 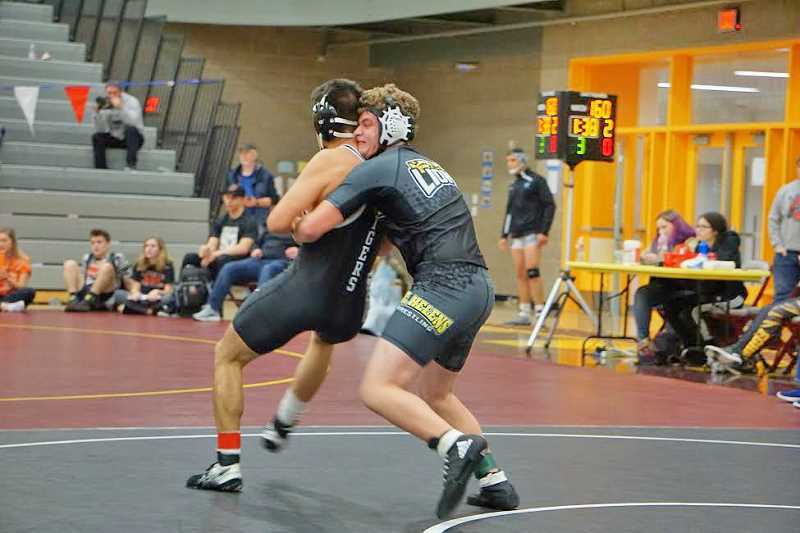 Josiah Andersen, The Dalles/Dufur, 9-2; Consolation semifinal: LaVoie pinned Davin Chamberlain, Century, 1:57; Fifth-place match: Hunter Reynolds, Renegade Forest Grove, pinned LaVoie, 2:47. Round 1: Nolan Womack, Newberg, def. Webb, 7-2; Consolation round 1: Webb received a bye; Consolation round 2: Josh Rowden, Canby, def. Webb, major decision, 11-3. Round 1: Lee pinned Porter Levenson, Franklin, 1:00; Quarterfinal: Glenn Breckterfield, The Dalles/Dufur, def. Lee, 8-5; Consolation round 2: Lee def. Ben Redwine, Newberg, 8-4; Consolation semifinal: Lee def. Alex Leon, Tigard, 4-3; Fifth-place match: Harrison Kinney, Canby, pinned Lee, 1:29. Round 1: Burri received a bye; Quarterfinal: Cael Matta. South Albany, pinned Burri, 5:56; Consolation round 2: Burri pinned Everett Chiles, Madison, 2:41; Consolation semifinal: Burri def. Ben Sorenson. Glencoe, 4-1; Fifth-place match: Burri def. Eduardo Belmont. Tigard, tiebreaker, 4-1. Round 1: Rask pinned Erick Garcia, Century, :45; Quarterfinal: Cole McCallister, Tigard, pinned Rask, 3:45; Consolation round 2: Rask def. Opath Silapath, The Dalles/Dufur, major decision, 12-4; Consolation semifinal: Rask def. Leonardo Uribe, Franklin, 7-1; Fifth-place match: Braden Baxter, Newberg, def. Rask, 8-6. Round 1: Leanna pinned Patrick Churchill, Franklin, 3:28; Quarterfinal: Josh Grant, Century, pinned Leanna, :34; Consolation round 2: Josh Burkes, Beaverton, pinned Leanna, 4:39. Round 1: Scott pinned Levi Kruegar, Renegade The Dalles, :41; Quarterfinal: Gabe Mortensen, Franklin, pinned Scott, :23; Consolation round 2: Stan Frame, Forest Grove, pinned Scott, 1:45. Round 1: Carter received a bye; Quarterfinal: Anthony Perez, Century, pinned Carter, 1:02; Consolation round 2: Augustin Aguas, Renegade Century, def. Carter, 3-0. Round 1: Carter pinned Johnny Nomani, Renegade Tigard, 3:50; Quarterfinal: Carter def. Kyler Boyd, Canby, 11-10; Semifinal: Rory Sullivan, Madison, pinned Carter, 2:56; Third-place match: Carter pinned Javier Velasquez, Tigard, 1:48. Quarterfinal: Smith received a bye; Semifinal: Smith pinned Simone Willingham, Centennial, 4:27; First-place match: Smith pinned Maria Reeder, Beaverton, :47. Round 1: Hadley Massey, Newberg, pinned Coddington, 5:23; Consolation round 1: Coddington received a bye; Consolation round 2: Coddington pinned Eliana Regory, Century, 2:23; Consolation round 3: Hunter Partain, Central, pinned Coddington, 1:16.